"a lot of Americans have never visited a mosque. To the folks watching this today who haven't — think of your own church, or synagogue, or temple, and a mosque like this will be very familiar. This is where families come to worship and express their love for God and each other. There's a school where teachers open young minds. Kids play baseball and football and basketball — boys and girls — I hear they're pretty good. Cub Scouts, Girl Scouts meet, recite the Pledge of Allegiance here." Obama at the Islamic Society of Baltimore. All true, but what about the dark side, the unique and repeated role of mosques in parlaying totalitarian ideas and fomenting violence? That goes unsaid in the president's rose-colored presentation. "as Muslim Americans, you [worry that] your entire community so often is targeted or blamed for the violent acts of the very few." Obama makes Muslims sound like innocent bystanders when there's a perfectly reasonable fear of them due to (1) so much violence emanating from this 1 percent of the U.S. population and (2) non-violent Muslims showing sympathy for the violent ones. "The Muslim American community remains relatively small—several million people in this country." This is a coy way for Obama to walk back his exaggerated 7 million figure of 2009 without explicitly saying so. "recently, we've heard inexcusable political rhetoric against Muslim Americans that has no place in our country." A veiled critique of Donald Trump that Trump deserves. "No surprise, then, that threats and harassment of Muslim Americans have surged." That's ridiculous. Insofar as there has been a surge of threats and harassment – and this is open to doubt given the disreputable nature of the reporting – this is due to Muslim violence. Reasonably, non-Muslims worry that a co-worker will behead them or attack them at a party, that they'll be bombed attending a sporting event, or rammed into by planes when working at their offices. To blame non-Muslims for this commonsensical, life-preserving fear is to confuse symptom with cause. "For more than a thousand years, people have been drawn to Islam's message of peace." Some converts, to be sure, have been attracted to the peaceable side of Islam but many others have seen it as a militant force and converting as joining a winning team. Look at the Western converts who have gone to ISIS as one subset of these. Again, Obama just focuses on the cheery dimension and ignores the unpleasant one. "the very word itself, Islam, comes from salam — peace." How can a person in a position of responsibility say something so patently wrong? Islam means submission, and does not derive from peace. As I explained in 2005, "There is no connection in meaning between salām and islām, peace and submission. These are two distinct words with unrelated meetings." Shame on Obama. "For Christians like myself ..."
Standing in a mosque, Obama presumably feels a need to remind his audience that he's not a Muslim. 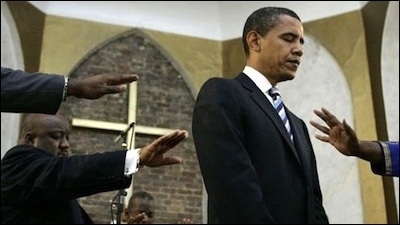 Obama sometimes declares he has "always been a Christian," other times that he "didn't become a Christian" until after college. He would be more convincing if he could get his autobiography straight. For example, he sometimes declares he has "always been a Christian" and at other times that he "didn't become a Christian" until after college. It would also help if he could date this important milestone rather than offer, in the view of Jason Kissner, an associate professor of criminology at California State University, Fresno, there are "two completely contradictory accounts" regarding its time frame. "Muslim Americans keep us safe. They're our police and our firefighters. They're in homeland security, in our intelligence community. They serve honorably in our armed forces." Again true, but again not mentioning the other side – the persistent penetration of American security and military services by Islamist enemies. "it is undeniable that a small fraction of Muslims propagate a perverted interpretation of Islam." Here we go again, Imam Obama declaiming on what the proper and the perverted interpretation of Islam are. He's done this before, as have many other non-Muslim leaders, including prior U.S. presidents. It's silly and embarrassing. "right now, there is a organized extremist element that draws selectively from Islamic texts, twists them in an attempt to justify their killing and their terror." It would be more accurate to replace this with "right now, there is a organized extremist element that draws on medieval Islamic texts and interprets them in medieval ways to justify their killing and their terror." "Part of what's happened in the Middle East and North Africa and other places where we see sectarian violence is religion being a tool for another agenda — for power, for control." 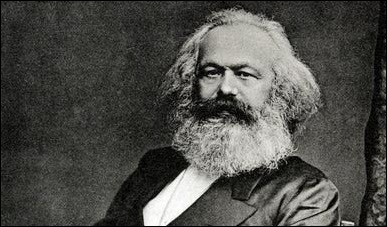 Like Karl Marx, Obama sees religion in entirely instrumental terms. This is typical left-wing materialism, which sees religion as a vehicle for something else, usually connected with economic benefit. No, the Islamists are true believers who engage in violence to pursue their vision, not for power as an end in itself, as Obama insists. "Thomas Jefferson's opponents tried to stir things up by suggesting he was a Muslim – so I was not the first. No, it's true, it's true. Look it up. I'm in good company." I did look it up – in Jefferson's Religion, a 2007 book by Stephen J. Vicchio, and found no evidence that Jefferson was called a Muslim. His opponents called him names such as "French infidel," "confirmed infidel," "howling atheist," and "fanatic," but never "Mahometan." "just as faith leaders, including Muslims, must speak out when Christians are persecuted around the world – or when anti-Semitism is on the rise – because the fact is, is that there are Christians who are targeted now in the Middle East, despite having been there for centuries, and there are Jews who've lived in places like France for centuries who now feel obliged to leave because they feel themselves under assault — sometimes by Muslims." It's not a complete or coherent sentence but it does correctly demand that Muslims speak out against religious persecution and it does note that Jews in Europe are "sometimes" (really, nearly always) attacked by Muslims. It's a relief to see the dark side peek through for an instant. This is a cheap laugh line. No one thinks the problem of Islamist violence would be solved by Obama using the right wording; many, including me, however, say that he can't properly address the problem unless he accurately identifies it. "Groups like ISIL are desperate for legitimacy. They try to portray themselves as religious leaders and holy warriors who speak for Islam. I refuse to give them legitimacy." 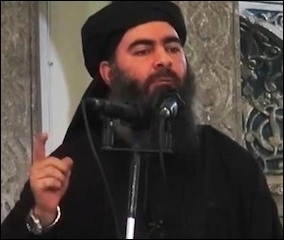 Abu Bakr al-Baghdadi isn't waiting with baited breath for Obama to affirm ISIS is Islamic. In fact, ISIL (or ISIS, Islamic State, Daesh) could not care less what Obama or other non-Muslims think of it. It cares only about the views of Sunni Muslims. So, Obama can deny it legitimacy all he wants; ISIS won't notice or care. "the notion that America is at war with Islam ignores the fact that the world's religions are a part of who we are. We can't be at war with any other religion because the world's religions are a part of the very fabric of the United States, our national character." By this infantile logic, Hitler could not have been at war with Judaism because Jews were part of the very fabric of Germany. "the best way for us to fight terrorism is to deny these organizations legitimacy and to show that here in the United States of America, we do not suppress Islam; we celebrate and lift up the success of Muslim Americans." No, the best way to fight Muslim violence is by (1) getting out of the way of law enforcement and others on the front line and (2) helping anti-Islamist Muslims find their voice. "we can't suggest that Islam itself is at the root of the problem. That betrays our values. It alienates Muslim Americans. It's hurtful to those kids who are trying to go to school and are members of the Boy Scouts, and are thinking about joining our military." This nicely summarizes the Establishment mentality that one must not publicly connect Islam to violence; just whisper this behind closed doors. "Muslims around the world have a responsibility to reject extremist ideologies that are trying to penetrate within Muslim communities. Here at this mosque, and across our country and around the world, Muslim leaders are roundly and repeatedly and consistently condemning terrorism." 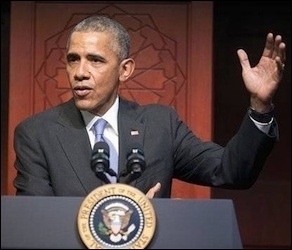 The equation of "reject[ing] extremist ideologies" and "condemning terrorism" reveals Obama's facile understanding of the Islamist challenge, reducing it merely to wanton political violence. Stop that violence and the problem is solved. Hardly; for lawful Islamism poses a deeper threat than some bomb-totting fanatics. "this is not a clash of civilizations between the West and Islam. This is a struggle between the peace-loving, overwhelming majority of Muslims around the world and a radical, tiny minority. And ultimately, I'm confident that the overwhelming majority will win that battle. Muslims will decide the future of your faith. And I'm confident in the direction that it will go." I would phrase it quite differently but I endorse these sentiments. "If you're ever wondering whether you fit in here, let me say it as clearly as I can, as President of the United States: You fit in here – right here. You're right where you belong. You're part of America, too. You're not Muslim or American. You're Muslim and American." I endorse this as well. After more than 200 years, our blended heritage, the patchwork quilt which is America, that is not a weakness, that is one of our greatest strengths. It's what makes us a beacon to the world." These are unusually patriotic and warm words for the United States from a leftist who rarely has much good to say about his own country. Good to hear them. In all, this speech gets much more wrong than it gets right, from factual mistakes to evasions to distortions. It does get a few points right, especially toward the end, but as a whole, it's a typically shoddy Obama production.